The personal is political for Sonya Clark, a Virginia-based fiber artist whose practice explores the interwoven histories, functions, and cultural meanings of everyday objects. A first-generation immigrant with African American, Scottish, and Caribbean roots, Clark calls on viewers to consider their own personal histories in the context of wide swaths of intersecting geographies and generations. It’s a practice firmly rooted in her own childhood, which included time spent with the maternal grandmother who taught Clark to work with two materials central to this exhibition: cloth and human hair. While styling Clark’s hair, and teaching her to sew, the artist’s grandmother shared stories infused with family history, weaving together a narrative that would significantly shape the artist’s choice of subject matter and materials. It’s poignantly present in “Plain Weave” (2008), bearing patterns created with black plastic combs and threads, the formal use of which reveals how banal objects may carry overlapping layers of personal emotions and communal histories. The work references slaves who would sew secret messages into quilts. In other works Clark uses her own hair, emphasizing how the personal and political are ever intertwined. For Clark, craft is a tool for shaping social justice slowly and intently, in deliberate contrast to the preoccupation of the present age with speed and immediate gratification. 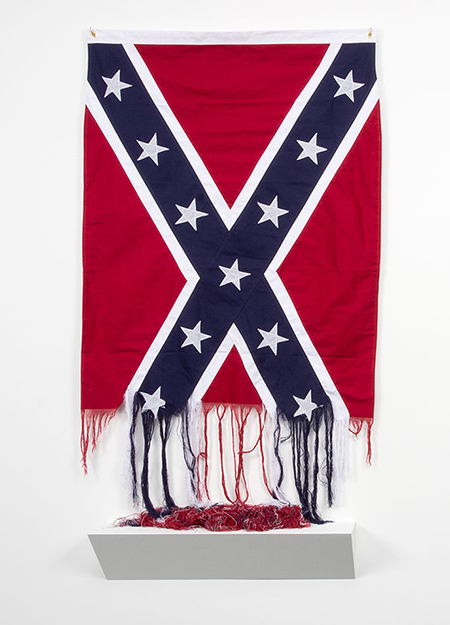 Consider “Unraveled” (2015), a cotton confederate battle flag whose partially unraveled lower portion remains pointedly visible in a small pile on a wall pedestal beneath the damaged remainder. It is not the only such flag; often the artist invites gallery-goers to assist with undoing these flags, typically fabricated so the work is tedious. The better to appreciate the enormity of the task and the absolute imperative to persist. In “Whitewashed” (2017) the faded form of stripes on an American flag are overshadowed by paint in colors that reveal the artist’s use of humor to call out bigotry. Additional works such as “Incredible White,” “Storyteller” and “Natural Choice” also punctuate the presence of white privilege, amid fierce denials of its existence. Even so, the exhibition exudes hope. Because in Clark’s narrative, the transformation is already underway.